I had a busy week at work and lots of classes. This was my last week open in the library at school, so everyone needed a new book to read! We still have 7 days of school, but as of Tuesday the library will be closed for the summer and I begin the task of getting books back, shelving them and doing some rearranging. We have been back in our newly remodeled building for over a year, and I have some changes I want to make in the location of the books. I already moved several sections around midway through the year, but need to finish now so it all makes sense. As you can see, the beginners' quilts are coming along nicely and it was fun to see them put the finishing touches on the quilt tops. Next week, they layer, pin and start tying. Her borders really aren't ruffly, it's just hanging on the wall funny. Several of them spent some time looking for backing fabric and batting after class. Wednesday night, the Sampler Pick group met. They are each working on a different quilt, so that's always interesting. There were also three of the beginners there making up last week's class, so we had lots going on and lots of eye candy. We are all learning a lot about fabric choices from Lora...most of us have commented that we probably wouldn't have picked the background she is using (including her!) but she is making it for a young couple and they wanted something modern. Click on the photo above to see her geometric background better. 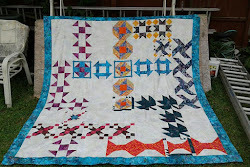 This is Lisa's second quilt and she is doing a great job with this sampler. She has six alternate blocks to make and is going to work on them this month as homework. Her dad, George, is also making his second quilt. He started working on the large center Carpenter's Wheel block Wed. night. No pics yet, but hopefully by next time! Dorothy and Kelli had all the sections made for their blocks, but they weren't completely sewn together yet so we'll have to wait til next time to see the finished blocks. 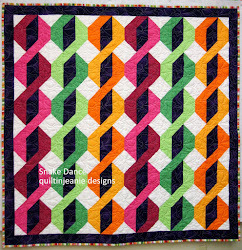 I don't think people always realize just how much time and energy goes in to making a quilt. 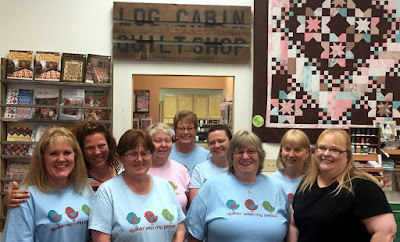 As these quilters choose more difficult samplers to make, they are making more complicated blocks, learning new skills and perfecting those basic cutting and precise sewing skills as well (not to mention "how to fix it" skills!). They challenge me in lots of ways. I guess that is one of the things I really like about teaching...I have to come up with new ideas, and continue to learn new methods to encourage and inspire them. I haven't gotten much done in the way of cleaning the past few weeks, so hope to work on that today. I also need to get my tomatoes in the garden, too! 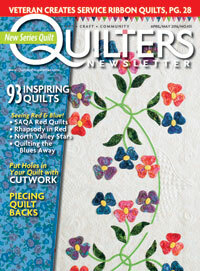 I'd much rather be quilting. I am heading up to my hometown to spend some time with my dad tomorrow, so I'm looking forward to that. What are your plans for the weekend? Looks like the makings of some great quilts! On to the finish line!